This new edition, supplanting the Bettoney version, is based upon Weissenborn’s original versions. For the first time, the Method and the contents of Op. 8, Volumes 1 and 2 are presented in one book. Milde’s Scale and Chord Studies remain. Very little has been removed from the previous Bettoney edition. • For the First time, a Comprehensive Study Key has been included, linking each lesson in the method to other parts of the book appropriate for study at that lesson’s level of advancement. This allows the student and teacher to coordinate the entirety of the book’s contents into a fully integrated method. • Exercises in Part I (Essential Kinds of Expression) have been revised so that they are now incorporated into the First 20 lessons of the original Method. • Exercises in Part II (Tenor Clef) are now introduced within the Method, starting with Lesson XXI A. • Revised, modernized and expanded Introduction with modern illustrations. • Frank Morelli’s “The Basics of Bassoon Playing” and “Advanced Methods for Improving Intonation, Tone Production, Tonguing and Finger Technique” offer comprehensive basic and advanced pedagogical instruction. • A new section, “Intermediate Studies,” from Op. 8, Vol. 1, provides an important bridge to the more advanced studies that follow. 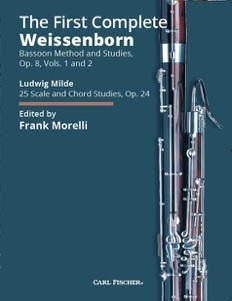 • Newly added lessons introduce all of the notes (from high B to high E), used by Weissenborn in his Fifty Advanced Studies (Op. 8, Vol. 2), but not introduced in his Fagott-Schule. • The tenor clef, introduced in Lesson XXIA, is then included in subsequent lessons, so that the student gains mastery of this clef while learning the notes for which it is most often used. • Bonus Duets have been added to each lesson, beginning with Lesson II. These thirty-six duets, designed to enhance the learning experience, are based upon popular themes and many of the most important bassoon solos from the orchestral repertoire. • Newly added “Fun Facts,” offer welcoming and tantalizing information while encouraging greater musical appreciation and curiosity. • A revised and expanded glossary of definitions of musical terms found in this volume.